All Christians, by definition, claim a belief in Christ as the son of God, but how many of them have actually read their Bible with understanding? It is impossible to comprehend what God is trying to tell us without rightly dividing the Word, knowing the subject and object of what you’re reading. You do not pick up a novel, read a few sentences here and there, and then claim to understand what the novelist is trying to convey. So why do you think the same will work with the Word of God? 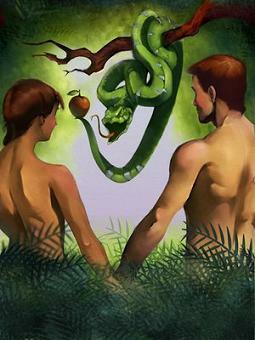 Not too long ago I actually heard a minister claim that in the beginning snakes not only talked, but walked on two legs and it was only after God cursed them for tempting Eve into eating an apple that they began to crawl on their belly. That statement is wrong on so many levels. First, the word apple is not even written in the book of Genesis. The first time apple is used appears is in the book of Deuteronomy and even there is was not referring to fruit. And second, snakes never walked or talked, not even in the Garden of Eden. In Scripture a figure of speech is never used except for the purpose of calling attention to or emphasizing and/or intensifying the reality of the literal sense and the truth of historical facts. In other words, the words used may not be strictly true to the letter – but they are all more true to the truth conveyed. Genesis 3:1 reads that the “serpent was more subtle than any beast of the field which the Lord God had made.” The Hebrew word, serpent, as used in Genesis is nachash, meaning to shine or a shining one, from a prime root meaning to whisper or enchant. Serpent in the Chaldee language means brass or copper because of its shining (2 Kings 18:4). The Hebrew word subtle is aruwm, meaning cunning or crafty. In other words, the serpent in the Garden was not a snake but a description of an individual that Eve perceived to possess superior knowledge. As a second witness, Paul wrote in 2 Cor. 11:3 “. . .as the serpent beguiled Eve through his subtility. . .” Paul uses the Greek word for serpent, ophis that means figuratively a snake, or a malicious person. Subtility in Greek is labiybah meaning craftiness. Beast as used in Genesis 3 is the Hebrew word chay meaning alive from the prime root chayah meaning to live, to be whole. This is in direct contrast to Gen: 6:7, 7:2, 8:20 and 34:23 where the Hebrew word “bhemah” is used to denote a “dumb beast” or animal. So when Satan is spoken of as a serpent it is only an implied representation such as when Dan is called a serpent (Gen 49:17), or Nero called a lion (2Tim:4:17), or Herod a fox (Luke 13:32) or Judah a lion’s whelp or when doctrine is called leaven (Matt 16:6), or when you might refer to someone as a snake in the grass. In Genesis 3:14 we read that God cursed the serpent “above all cattle, and above every beast (living being) of the field; upon thy belly shalt thou go and dust shalt thou eat all the days of thy life:” This paints a picture of Satan’s ultimate humiliation and defeat, just as in Psalm 44:25 where it says “our belly cleaveth unto the ground,” denotes a long prostration and submission. God tells the being in the garden that he will put enmity between him and the woman and between thy seed and her seed; He [Christ] shall bruise thy head and thou shalt bruise His heel. The Hebrew word for seed, as used throughout the Old Testament, is zara, meaning to conceive seed, from the prime root zera to conceive. As a second witness, Christ taught a parable in Matthew 24:24-30, likening the Kingdom of heaven to a man which sowed good seed in his field and while he slept, his enemy sowed tares among the wheat and went his way. And Christ told his servants to leave them alone, let them grow up together until the harvest when they would be separated from the good wheat, bound and burned. He explained the parable in Matthew 37:38 saying that the field was the world; the good seed are his children but the tares are the children of the wicked one. The Greek word seed as used in the parable is sperma, meaning seed, by implication the male sperm. If you still have a problem accepting the concept of the Serpent in the Garden as Satan, read Rev 12:9 “and the great dragon was cast out, that old serpent, called the Devil and Satan. . .” Dragon is the Greek word “drakon,” a kind of serpent as supposed to fascinate. In Rev 9:11 we learn that Satan is also called Abaddon meaning the destroyer, and Apollyon meaning the destroying angel of the abyss. In Isaiah 12:24 Satan is called the King of Babylon (confusion) and Lucifer (the morning star in the sense of brightness or shining, as in the serpent in the Garden) in Isaiah 14:12-14. In Ezekiel he is called the King of Tyre and John (17:12) calls him the Son of Perdition (eternal damnation). Satan has many names and many disguises that he uses in the religious arena. Many Christians think that the seeds of heresy are found only in cults and in off-beat religious sects, but the truth is Satan knows the Word better than most ministers and spreads his deceptions through the pulpit. John, in his first letter, and Paul, in his letter to the Ephesians, reminds us that heretical teachers are often found within the church itself, just as Jesus taught in Matt: 13:2-9 that the dormant seeds of heresy can be sown from the pulpit. We are lost if we remain uninformed as to the truth of the Bible. We must be able to discern the difference between the “true Word” and “tradition,” the “essential” and the “incidental,” and to do that we must become dedicated students of the Scriptures.